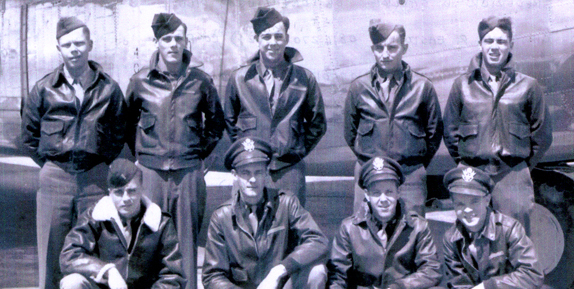 The Gaulke Crew 602 was one of the original crews for the 492nd BG that trained in Alamogordo, New Mexico. They had come up as Crew 1024 from the 32nd CCT at Davis-Monthan Air Field in Tucson, Arizona. After arriving to the 492nd the crew had their bombardier and one gunner replaced. They were assigned to the 856th BS, designated as Crew 602. Records show that 2nd Lt Fred Gaulke signed out for B-24J, 44-110134. However, no such number was ever manufactured. Further research shows it was 42-110134. To our knowledge their plane wasn't given a nickname. In April 1944, they flew their assigned aircraft to North Pickenham, England, via the southern route. Their ground Crew Chief, S/Sgt Ed Nydam, flew with them, thus bumping their new gunner, Pfc Warren Branch onto the Queen Elizabeth. Lt Gaulke flew as the aircraft commander for crew 602 for a total of 8 missions. We don't know if there were any personnel changes on any of their missions. But it is possible that their bombardier might had missed a couple of the pathfinder missions. Crew 602 barely survived the air battle on 19 May 44, during a raid to Brunswick. Although the ship was heavily damaged they did manage to limp back to England. They landed at the first base they saw at Shipdham, home of the 44th BG. Ten days later on their eighth and final mission, the Gaulke Crew 602 again cheated death during another battle with the Luftwaffe. This time they were bombing the well-defended oil refineries at Politz. The Luftwaffe didn't get them but the flak did. It had punctured their gas tanks. The engineer, Fry, was wounded. They knew their ship could not reach England. They had to attempt Sweden. They made it to Sweden's southern coast where they found a small airstrip in the middle of the woods. But it was too short to land a B-24. Sgts Branch and Baker proposed tying their parachutes to the wasit guns and opening them just as soon as the plane touches down. Gaulke agreed to try it. Branch's side held but Baker's didn't. But it was enough for Gaulke to bring the plane to a halt with a 100 feet to spare. Sgt Fry was rushed to the hospital by a Swedish rescue team. The crew's landing attracted a large civilian crowd at the end of the runway to see the Liberator. Then another B-24 from the 445th BG came in for an emergency landing. They weren't using any chutes to help them stop. Thanks to a shot up tire on one side, the plane did a ground loop when it landed. Otherwise, they would have run into the crowd. Casualty figure: 10 interned in Sweden, MACR 5220. Page last modified Friday, March 8, 2013.